I love sewing. I became a seamstress at the age of 11 which makes that 26 years and many, many outfits and other stuff that I’ve put together with needle and thread. 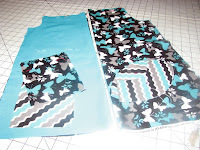 Sewing was my first love in the world of crafting. It helped me to discover the world of design and creativity. I have now decided to take that love of both sewing and creativity to a new project. 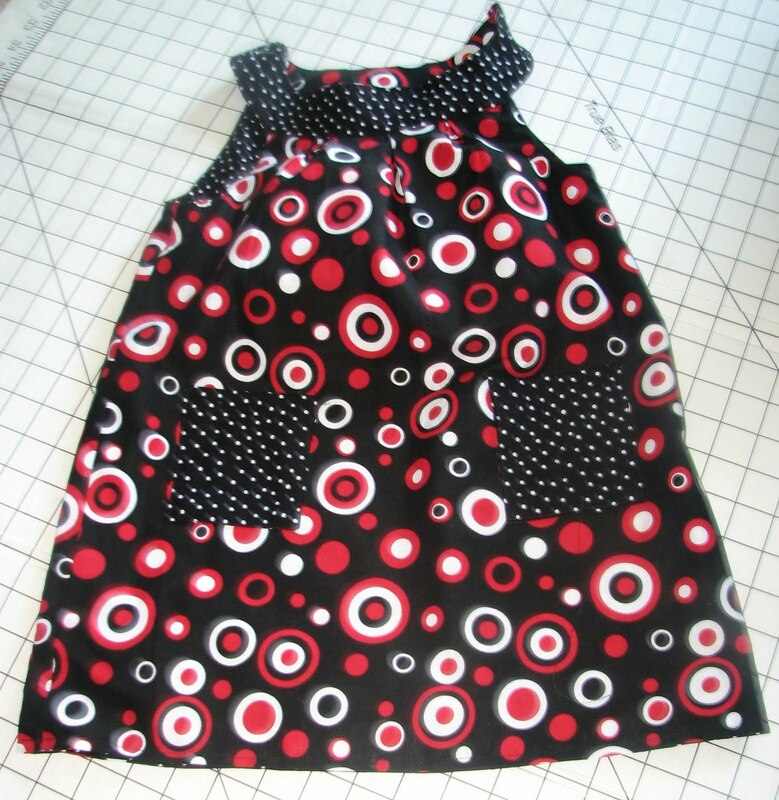 I have begun to make clothing for little girls (the boys will soon follow), ages newborn to five. This line of clothing, Dress Me Diva, is inspired by my daughter, Olivia. She was a micro-preemie, born at 1 lb. 1oz. and as I write this she is now five pounds four ounces and doing well. Dress Me Diva is a colorful, whimsical cute and original way to dress your little diva. I guarantee that your little diva will love our clothes. An adventurous story each outfit will tell from the start of choosing the fabrics to the last finishing touch of that last button. So follow us on Facebook, twitter and more of Dress Me Diva. 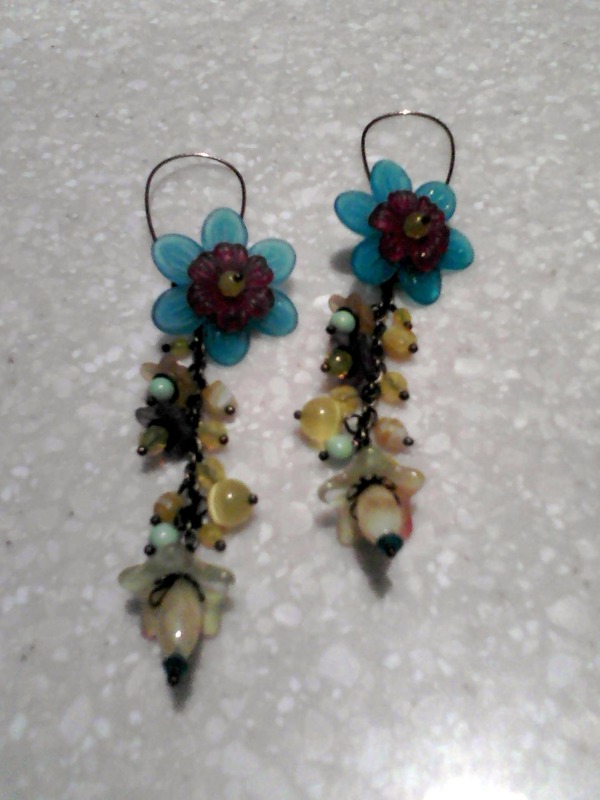 I was at the hospital tonight and decided to make a pair of earrings. The picture does not do them justice. Very pretty! I did the jewelry demo at work Saturday, August 20th. I originally wanted to do it but schedule did not permit me to sign-up. As fate would have it my manager approached me while I was at the cutting counter and told me..."Serena, you're doing the jewelry demo today." I was happy. I rather make jewelry then cut fabric any day! When I approached the demo table there were three guests waiting for me. I love the introduction that my manager gave for me. She said, "This is Serena, our resident jewelry designer. She has also been published in one of the magazines we sell up front." They thought she meant one of Joann's newsletters and she even corrected them and said no a national publication, Bead Trends. I thought that was nice of her, made me feel good! I felt accomplished! Anyway, the demo was making stretch bracelets with those bead sets (I think the sets were Jesse James). I've done demos for these beads before and I think I want to buy a couple of packages. We made five bracelets with three packages (not bad). Debbie who was one of the guests waiting stayed with me for the whole demo. She helped me take these lovely pictures with my phone camera. Thank you Debbie! I will leave a comment letting you all know what company offers the bead sets in case someone is interested. 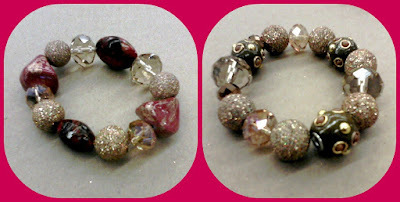 Similar bracelets are for sale 3 for $12, 5 for $20.